It is nearing December and the weather has been chilly in Singapore lately so today I made sweet red bean soup to keep me as warm as toast even though it’s windy and cold outside :). 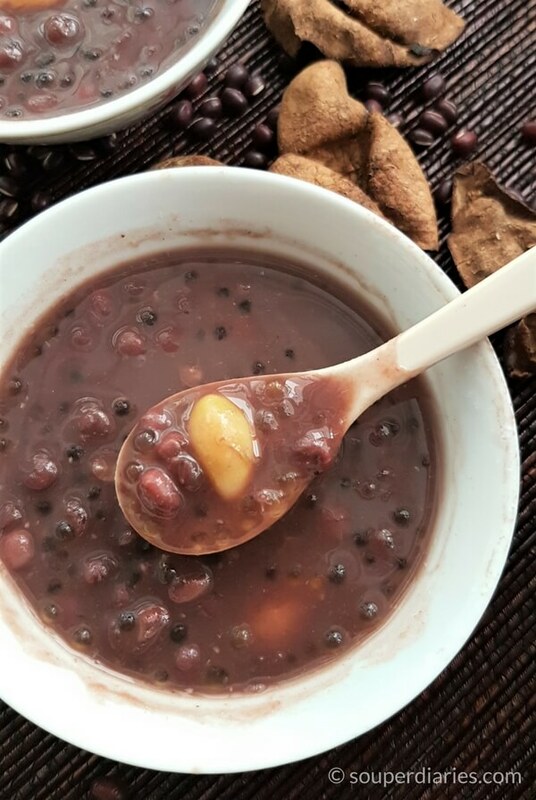 Red bean soup (紅豆汤 hóng dòu tāng) is an all time classic Chinese dessert soup. This post was first published on Dec 4, 2015 and now updated on 18/11/16 with improved recipe and photos. 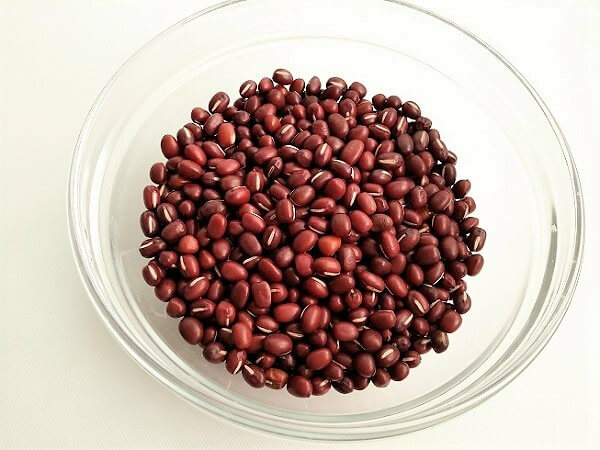 The basic ingredients for this red bean soup recipe are red beans (also known as adzuki beans), dried tangerine peel and rock sugar. For this recipe, I added ginkgo nuts and sago for extra texture to the soup. If you have pandan leaves, tie a few into a knot and throw them into the soup pot as well to add some fragrance. Other variations of this soup include the addition of ingredients like lotus seeds, red dates, dried longan, tang yuan (glutinous rice balls) and coconut milk. If you’re using coconut milk, consume the red bean soup as soon as you can as it will not stay fresh nor keep well for long. Substitute with low-fat coconut milk for a healthier option. Compared to green beans, red beans take a longer time to cook and soften. Soak the beans overnight in water to shorten the cooking process and prevent flatulence. From my observation, the quality of the beans you use will also affect the length of the cooking time. An old batch of red beans that I bought took a much longer time to cook compared to a newer purchase. Try not to keep raw beans for long periods of time as it will affect their quality. In Traditional Chinese Medicine, red beans is believed to reduce fluid retention, alleviate oedema, promote diuresis, eliminate skin heat and toxins, and help with weight loss. Consumption of ginkgo nuts treat coughs and fluid discharges, alleviate asthma and helps to preserve the functions of the brain. 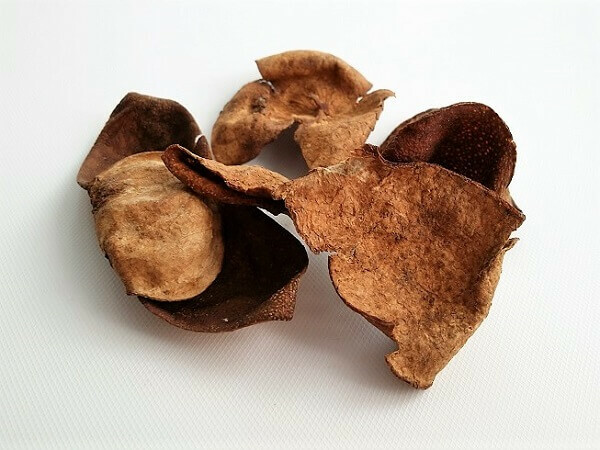 Dried tangerine peel (called chen pi) is a warming ingredient high in antioxidants and helps with indigestion, reduces nausea and treats diarrhea. Tea made from dried tangerine peels has many health benefits and one that I particularly like is that it helps to alleviate morning sickness in pregnant women. Dried tangerine peels add a citrusy flavor and scent to the soup. Try not to omit this ingredient as it really does give the soup a lovely aroma but do not add too many pieces of it. The first time I made this, I added about 5-6 pieces and it made the soup terribly bitter. My daughter took a sip and cringed. So, lesson learnt. One piece is sufficient. A little goes a long way. If you think you need more, add another piece only after you’ve tasted the soup. Some like this soup with a thick consistency while others prefer it thinner. I am personally partial to the thicker version. To thicken the red bean soup, you can either use a blender to blend the softened beans or manually mash them with the back of a spoon. 1. Leftovers of this sweet soup can be freezed up and made into delicious popsicles. 2. Serve the red bean soup with a scoop of ice-cream for a refreshing and yummy treat! Don’t want to miss a recipe? Sign up for Souper Diaries newsletter delivered to your inbox! Let’s connect on Facebook, Instagram, Pinterest, Twitter and Google+. See you again and happy cooking! 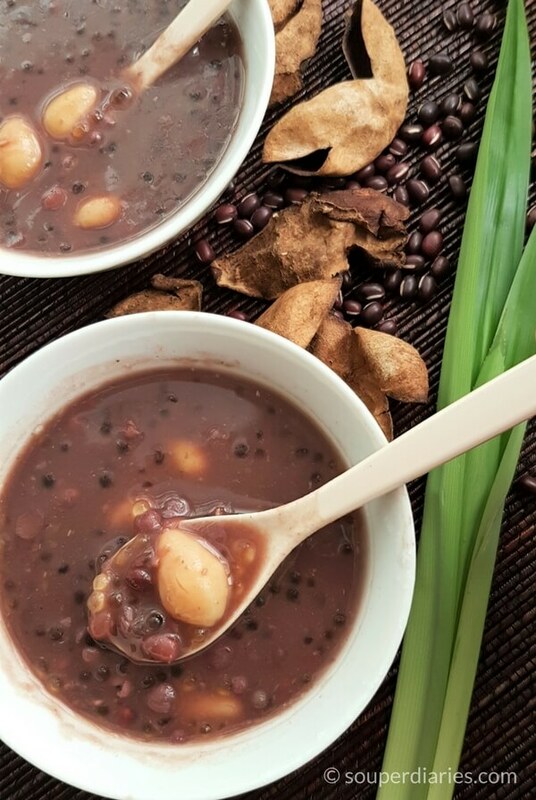 A 'warming' dessert, red bean soup is a delicious dessert for any time of the day! To cook sago: Bring a small pot of water to a boil. Pour in sago seeds and let it simmer for around 5 minutes. Turn off heat and keep the pot covered for about 10 - 15 minutes. Let the remaining heat finish cooking the sago until it is all translucent and gelatinous. Once fully cooked, rinse the sago to remove any residual starch. Keep sago pearls submerged in some water (to prevent sticking) until ready to use in your dessert. Discard the soaking water for the beans and rinse. Scrape off the white pith from the inside of the softened dried tangerine peel with the back of a spoon and rinse. This is to reduce its bitterness. Put in the red beans, pandan leaves, dried tangerine peel and water into a medium sized soup pot. Bring to a boil and let it remain boiling for about 5 minutes. Lower the heat and simmer for about 1.5 to 2 hours or until the red beans are broken and soft. Remove the pandan leaves and dried tangerine peel. When the beans have softened and opened up, mash half (or all if you prefer) the red beans with the back of a spoon in a strainer placed over a bowl. Ladle up some soup and pour it through the strainer to let any remaining mashed beans return to the soup. Transfer the strained mixture back into the soup pot and discard the empty husks in the strainer. Alternatively, use a hand-held blender to blend till the beans are to your desired consistency. You may also transfer to a blender to blend and pour back the blended mixture back into the pot. Add an additional 1 cup of water or as needed if you find that the soup is too thick. Add the ginkgo nuts and cook for about 10 minutes. Add rock sugar and stir over medium heat till it dissolves. Add sago pearls if using. Turn off heat and serve. Preparation time does not include soaking time of the beans. We have had lots of snow in England so this soup sounds very tasty and warming and also healthy. Would this soup be ideal for weight loss? How long can this be kept frozen? I am looking forward to making this and cant wait to taste it. Very interesting about the effects of the dried tangerine peel with the health benefits. Sorry for the late reply. Yes, red bean soup is wonderful during the cold weather. Red beans are a good source of fiber so you will feel fuller for longer. They are also high in protein and low in calories. So yes, I would say this soup is ideal for weight loss. Check out this page for more information on the nutritional values of red beans. We always finish this dessert soup on the day it’s cooked as it tastes best when it’s freshly cooked and hot. There is nothing more delicious than a bowl of soup on a cold day. Red bean soup is one of my very favorite. I make it once every two weeks, but never thought about adding some of the ingredients that you have shared in this recipe. I use coconut milk whenever I cook it, but never thought about adding dried tangerine peels. I will have to try it the next time I prepare this soup. At what time do you remove the dried tangerine peels? There are many variations of red bean soup. Besides ginkgo nuts and sago seeds, sometimes I add some tang yuan (glutinous rice balls) or dried longan. I remove the dried tangerine peels before blending the red bean soup. Oh my God that looks and sounds delicious. As a huge bean lover I’ve never cooked beans that way now i have something new to try. Thank you for the information and the recepie! Red beans are super healthy, I love them so much. This Red bean soup recipe looks so yummy and I think it’s amazing especially in the winter, I don’t know how is winter where you live, but here in Italy the weather so cold! and that’s soup will keep me warm! A dessert red bean soup? Well I never! Would you recommend serving it chilled or warmed? Or both? Thanks for dropping by. I personally like it both ways. Warm and chilled as a popsicle. Hope you try this recipe real soon! It is a very typical and traditional chinese dessert, which tastes creamy, sweet and rich, super yummy! My mom is really good at making it, but i never know how to do! But after reading your article, i decide to give it a try. By the way, really appreciate that you show us the benefits the ingredients have. I’ve never heard of beans and soup as a dessert before, safe to say I can’t wait to give it a go. I have to confess I’ve not often liked asian style desserts in the past but I just love the idea of this citrus dessert that is also very healthy. on a side note, I am struggling to imagine Singapore being cold, I was there in September a few years ago and remember being drenched from the humidity! Asian style desserts are really yummy. Hope you’ll give them a try! This recipe looks fantastic! I do a lot of cooking but have never used most of these ingredients. I am intrigued and inspired to give them a try. Your website is lovely and your pictures beautiful, makes me hungry just looking st them. Great background information on why I really need to make this soup!!! This is a very informative article about red bean soup. I also was not aware of the ying and yang aspect of chinese culture.You learn something every day. I have a weight loss site and put a recipe for black bean soup and marinated peaches on it, maybe you would like to try something like that. Great background on the soup and the ingredients. Although the soup doesn’t look very appetizing to me, I’m sure it tastes great. Are the ingredients hard to find in Canada? The ingredients are quite common and you should be able to find them in an Asian dried goods store or the Asian section of your local supermarket. Hope it helps. Oh yum. Winter is coming on and I’m getting a craving for soup. Can’t wait to try this one. mmm, this red bean soup seems like something I would definitely like! Im a soup kinda girl, all kinds. Im going through all of your recipes now! Thanks for this lovely recipe. It looks easy, tasty, and healthy. I’m going to put my red beans into some water right now so they can soak overnight. How do you dry the tangerine peels? Any tips on that? Finally, I can’t believe it’s cold in Singapore! I love your country. Tangerine peels are dried by placing them under direct sunlight (sun-dried) for 3 days or more until all moisture is gone from the peels. Turn them over once in a while. I love this red bean soup! My aunt usually makes this for me when I go to visit her as she knows I love it. I like the texture of the soup with the soft beans and the liquid soup nice and liquid not thick. It makes me happy to know that there’s so much nutrition in this soup. I can enjoy the red bean soup and not feel guilty because it’s not dead calories. High in fiber with antioxidants and minerals hooray! This sounds like a great recipe! I may not have seen it but do you soak the beans and if so how long? The addition of tangerine peel must give it a great citrus taste. I look forward to trying it! Thanks for the Red bean soup recipe, I will have to try it this weekend. You know, I never got to try Red bean soup before when I lived in Hong Kong 12 years ago. I tried a lot of unique and interesting dishes, but never this soup. I wonder if it’s a geographical thing or just my lack of the experience. Either way, can’t wait to try your recipe. Red bean soup is a popular Chinese dessert that is also available in Hong Kong. Hope you’ll like this soup. Thanks for writing in.